As we continue our efforts to think about writing literacies as a focal point of our inquiry work in a high school library, my colleague Jennifer Lund and I continue to see the power of an old school technology: pen and paper. We’ve targeted the presearch phase of research projects as a sweet spot for using writing literacies as a medium for critical thinking and making visible student ideas, questions, and patterns of understanding. In their “Pathways to Knowledge” model of information literacy, Pappas and Tepe define presearch as the stage that “…enables searchers to connect their information need and prior knowledge. They may participate in a brainstorming activity to create a web or a list of questions on what they know about their subject or what they want to know” (Harada and Tepe). Presearch can provide instructional opportunities to show learners “strategies to narrow their focus and develop specific questions or define [an] information need” (Callison and Baker 20). 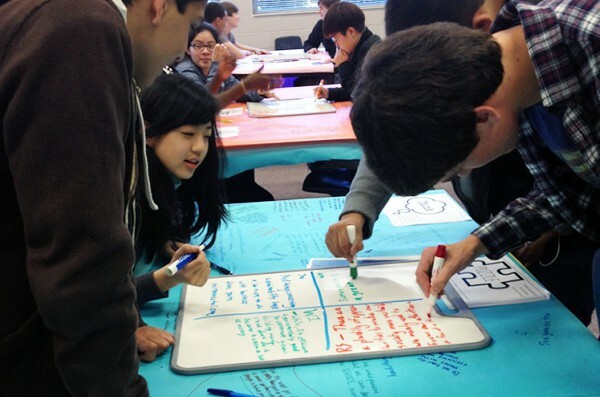 We have combined a variety of written conversation strategies adapted from the work of Harvey Daniels, Visible Thinking learning structures, and mindmapping activities to nurture student curiosity, spark questions, and help students connect existing knowledge to new information introduced through our presearch inquiry activities. In our educational landscape that is informed by multiple state and local standardized tests and common assessments, curriculum maps, and large departments competing for limited time and space in the media center and computer labs, helping teachers open up student research learning experiences from ones that are limited and tightly predefined by the teacher to those that give students opportunities to select and develop a topic focus is a huge step forward in our efforts as collaborative instructional partners and designers. Earlier this semester, we tried a tandem of activities, Think, Puzzle, Explore and preserach search term strategy mapping, to see if we could use writing literacies as a more intentional part of the process work of research. Callison, Daniel, and Katie Baker. “Elements of Information Inquiry, Evolution of Models, & Measured Reflection.” Knowledge Quest 43.2 (2014): 18-24. Academic Search Complete. Web. 7 Mar. 2015. Harada, Violet, and Ann Tepe. “Pathways to Knowledge [Trademark].” Teacher Librarian 26.2 (1998): 9. MasterFILE Elite. Web. 7 Mar. 2015.